REUTERS/John Sommers IIU.S. Senate minority leader Mitch McConnell addresses the crowd during a campaign rally in Louisville, Kentucky, November 1, 2014. McConnell is running against Democratic Senate candidate Alison Lundergan Grimes. 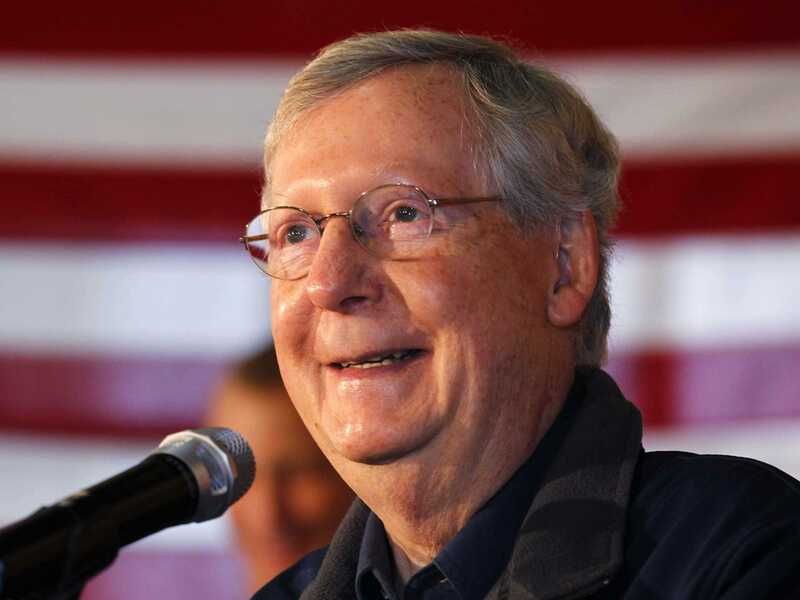 “There will be no government shutdowns, and no defaults on the national debt,” McConnell said during a press conference in Louisville, the day after he romped to a 16-point victory over Democratic challenger Alison Lundergan Grimes. After Tuesday night’s results, Republicans hold a 52-45 advantage in the Senate. When all is said and done, it’s likely they will control at least two more. McConnell expects to be elected the next majority leader upon the start of the next Congress. “I think he’s interested in moving forward. I said send us trade agreements. We’re anxious to take a look at them,” McConnell said. But he said the Senate will be “voting on things the administration is not fond of,” like the Keystone XL Pipeline, which the Obama administration has delayed multiple times over the past few years. McConnell said starting the final phase of the pipeline is only part of the GOP’s energy agenda. “The veto pen is a pretty powerful tool,” McConnell said. A big part of McConnell’s early plan as majority leader involves, as he put it, “getting the Senate back to normal.” McConnell has openly clashed with current Senate Majority Leader Harry Reid about his management of the Senate. A return to normalcy, for McConnell, means “working more” and possibly reverting some rules changes brought on by Reid. McConnell said he had gotten calls from “three prominent Democrats” in the past 18 hours who are “anxious to be relevant again” and get things accomplished in the Senate. “We’re going to function,” he said.